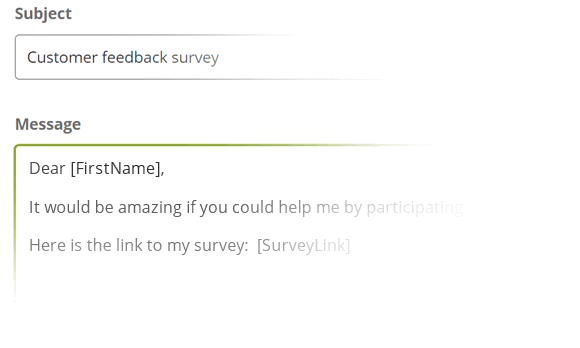 We make it easy for you to send bulk email invitations to invite people to participate in your online survey. 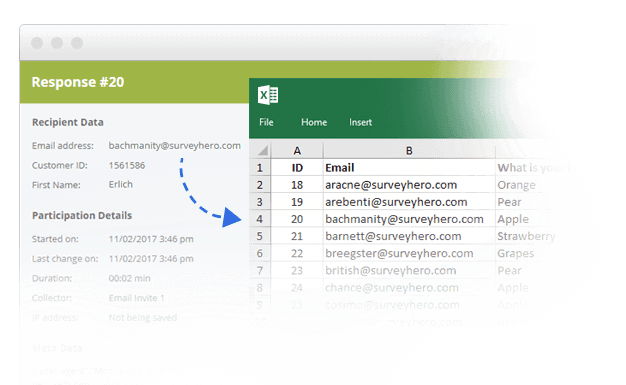 You can either add your email addresses one-by-one or add an unlimited number of recipients directly from Excel by simply copying and pasting them into SurveyHero. 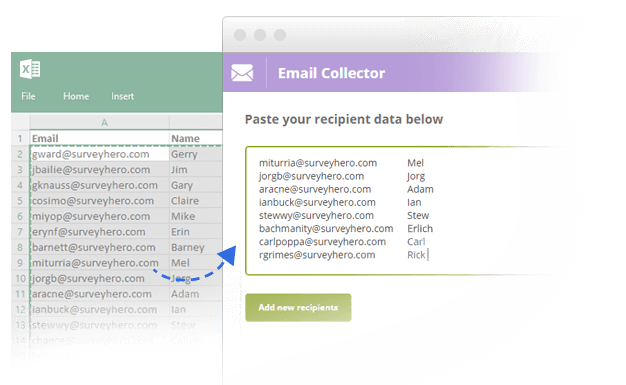 As well as the email address, you can also add extra columns of data if you choose to, such as first name, last name, etc. You can then use this data in the personalized email message. You can not only write your own custom message but also define which "From" name should be shown to the recipients as well as which email address you would like to use for sending. Additionally, if you have uploaded additional information about your recipients, e.g. "First name", you can simply personalize each email by using available placeholders. That way, each recipient will receive their personalized email, e.g. starting with "Dear Peter", "Dear Joanna", etc. When everything is ready and submitted, you can schedule the exact date and time in which you would like your invitation to be sent. Everything just works! We will automatically generate a unique survey link for each recipient, which will allow them to participate only once. We automatically take care of unsubscribes, bounced email addresses or complaints. That way, you do not have to manually maintain your address list. After a couple of days, you might want to send a reminder: This can be done with the simple push of a button! 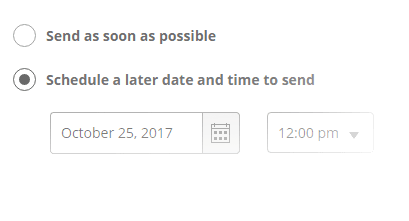 We will automatically send your reminder to only those recipients who have not yet completed your survey. One of the most important benefits you will gain when using our bulk email invitations, is that each response will be inherently connected to a single recipient. This means you will see the email address and data from the recipients you sent to (e.g. customers) directly in each individual response and in your exports. This completely removes the need to directly ask for a participant's contact details in the survey.